In 2011, DB announced a framework agreement with Bombardier for the delivery of 200 TRAXX Multi Engine diesel locomotives. A first call-off order was placed directly, comprising of 20 locos for services around Kempten (7), Mühldorf (8) and Frankfurt am Main (5). 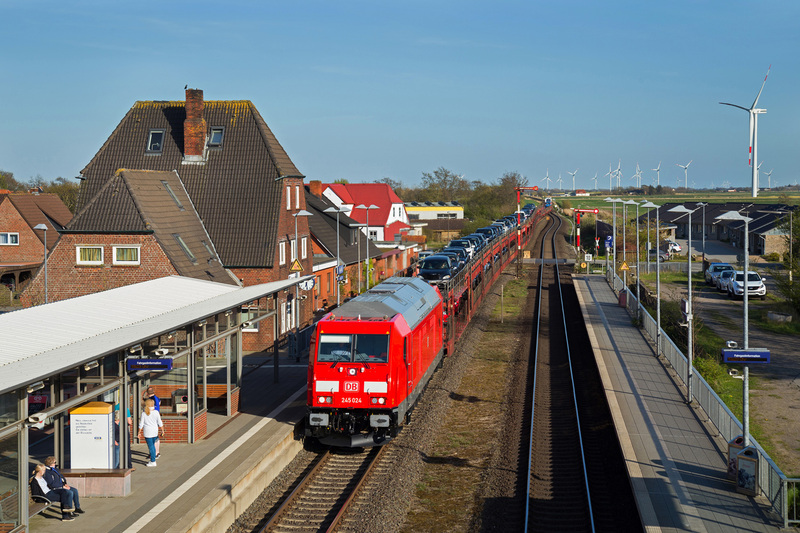 In mid-2014, DB ordered another 7 locos of its Sylt Shuttle to and from Westerland (Sylt). Now it has ordered another 9 locos and modifications to the Sylt Shuttles locos are underway. Bombardier is currently building an additional batch of Class 245 Multi Engine diesels for Deutsche Bahn, which will expand its fleet of the type from 27 to 36. On March 30, the designated 245 035 made a first test run, followed by the 245 036 on 20 April. They are two of three new locomotives that will be based in Ulm, as they carry the allocation markings “DB ZugBus Regionalverkehr Alb-Bodensee GmbH (RAB) Werk Ulm”. DB Fernverkehr will take delivery of the other six locos and will use five of them on ICE rescue services. The sixth loco is to be used on intercity services between Erfurt and Gera. The first three rescue locos are planned to join the German operator’s fleet between November 2017 and January 2018, followed by the IC locomotive in mid-2018. The remaining two rescue locos are scheduled for delivery in 2021. Meanwhile, the seven Sylt Shuttle locos of DB Fernverkehr (245 021-027) are being subjected to modifications at the Bombardier works in Kassel. One by one, the locos are sent to Kassel where their fuel tank is replaced. Off-delivery, the seven locos were equipped with a standard 2,720 liter fuel tank, similar to other locos of the class as delivered to DB Regio. It has been decided to upgrade the machines with larger tanks, increasing the fuel capacity to 4,230 liter. One of the locomotives that has already been equipped with a larger fuel tank is 245 027. This Sylt-based locomotive has recently gone on hire to DB Regio that operates regional trains between Hamburg-Altona and Westerland (Sylt) as part of the Netz West concession. DB Regio also uses Class 245 diesels here, but this concerns a fleet of 15 locomotives that are part of the concession and that are owned by Paribus-DIF-Netz-West-Lokomotiven GmbH & Co. KG. As both DB units now operate 245s to and from Sylt, they can benefit from a certain amount of flexibility if needed. Learn more about Bombardier TRAXX Multi Engine diesel locomotives on MainlineDiesels.net.